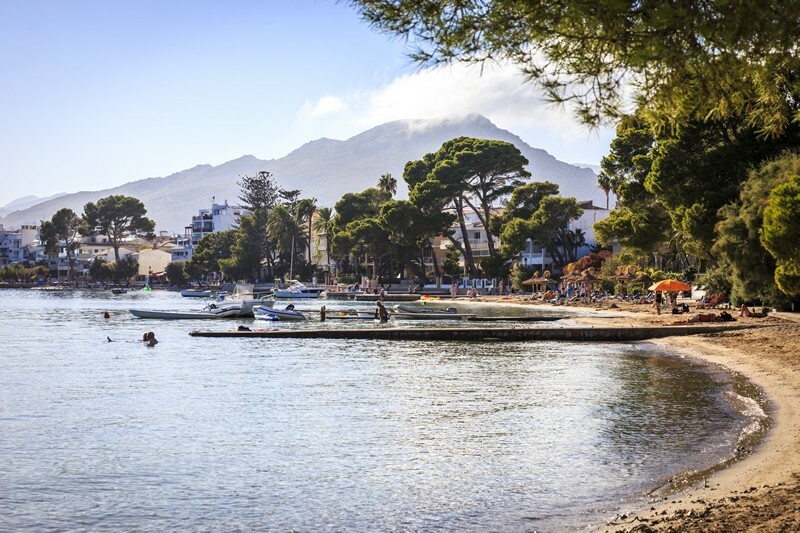 In the northernmost foothills of the Serra de Tramuntana Mountain range, in the northwest of Majorca, lies the municipality of Pollença, a place of fascinating scenery, and its four towns, Pollença, Port de Pollença, Formentor and Cala Sant Vicenç - are altogether unique. 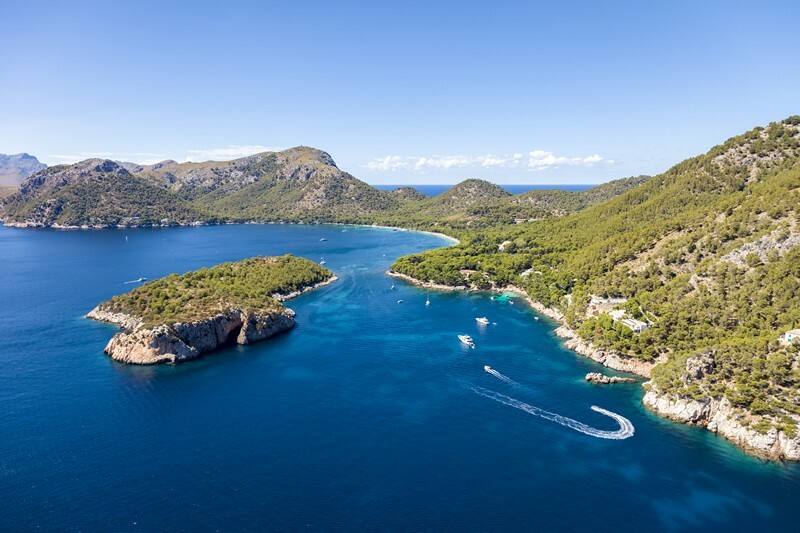 Considered to be one of the most privileged spots in the Mediterranean, Pollença stands out for the stunning turquoise waters of its sea and for the striking cliffs that tower above them, forming some of the island's most highly praised reliefs. A total of 17 beaches and coves, set in natural surroundings brimming with routes to explore, will bewitch hiking enthusiasts and any visitor wishing to relax and enjoy a holiday with sunshine and sea breezes, alone or with their family. 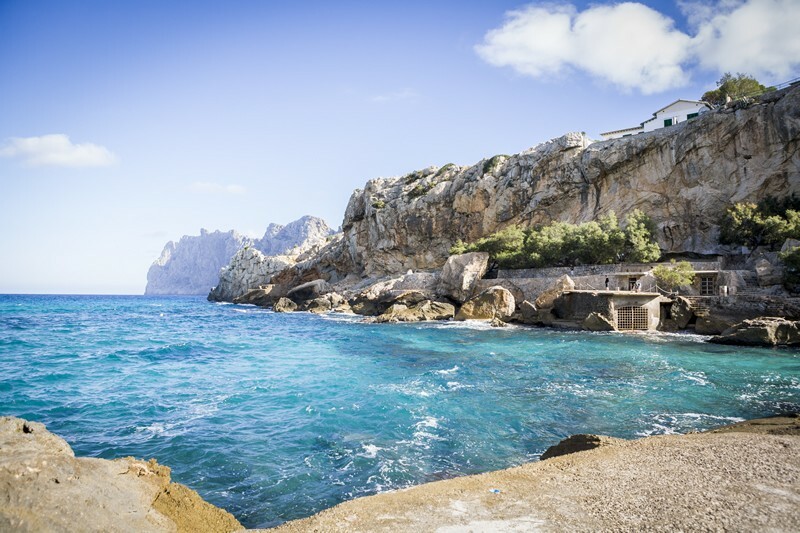 Thanks to optimum weather conditions, varied terrain and its extreme and ragged coastline, Pollença is ideal for cycling, as well as adventure and water sports of every kind. Pollença's cultural heritage is yet another of its attractions, given the numerous art and musical events, agricultural fairs and traditional festivities on offer throughout the year. In short, the municipality offers a perfect blend of scenery, culture and leisure: an unparalleled series of attractions that make it one of those truly genuine Mediterranean places that no visitor should miss. It is a privilege and a genuine delight for the senses to enjoy a coffee on one of the terraces of Pollença´s main square. The Plaça Major, surrounded by sandstone façades, has witnesseed centuries of history. Equally enjoyable is a stroll through its narrow medieval streets to the Nostra Senyora dels Angels Church, the Roser Vell Oratory, Sant Domingo Monastery or the Calvary Steps, whose 365 steps lead up to a small hermitage of the same name and offer wonderful views over the town. Since the early days of the 20th century Pollença has been a favourite destination and a source of inspiration for artists and writers from all over the world. Despite its fascinating cultural agenda, brimming with events and festivities, offers an insight into its traditions, history and people, Pollença has never lost the sense of tranquillity and the welcoming atmosphere that characterizes it, and draws visitors back again year after year. Considered to be one of Mallorca's leading tourist destinations, the Port of Pollença sits on a large bay, sheltered by the Punta de l'Avançada, the spectacular peninsula to the north of the town, with a lighthouse dating from the early years of the past century. Almost 1500 metres of white sand, bathed by calm waters, make up this beach, also known as Platja de Llenaire and where, as well as swimming, you can enjoy long walks, which on nights with a full moon, can be truly spectacular thanks to the beach's strategic setting. 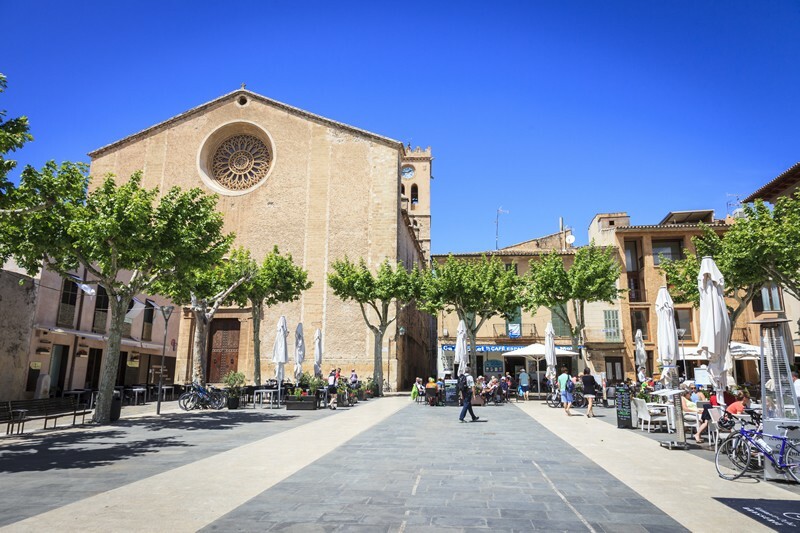 As well as being a pretty fishing port, with traditional Mallorcan llaüts, the Port of Polleça has a wide varierty of shops, boutiques, cafes and restaurants, offering exquisite international and local cuisine, along the Pine Walk, on the seafront and in the main square. An unbeatable location, nestled between the mountains and the sea, on Mallorca's emblematic northern coast. Blue is said to come in infinite different shades and there are those who claim that you can see each and every one of them in the coves of Cala Sant Vicenç. Cala Barques, Cala Clara, Cala Molins and Cala Carbó could be considered to be traces of what once might have been heaven itself. Looked over by the Cavall Bernat, perhaps the most impressive of the rock formations that surround the village, it is almost impossible to resist the charm of Cala Sant Vicenç's crystal clear waters and the bed of white sand beneath, where whimsical rocks inhabited by a multitude of marine species can be discerned. In this setting, surrounded by soaring peaks that rise up to over 300 metres, the black vulture can be often be seen, one of the local birds with the biggest wingspan. Cala Sant Vicenç's magnetic appeal was discovered decades ago by a large number of intellectuals and artists as important as Anglada Camarasa, Santiago Russinyol or Joaquín Sorolla himself. All of them chose this magnificent spot as their source of inspiration or holiday paradise. The Formentor peninsula is a fascinating stretch of land,12 Kilometres long and 3 Kilometres wide and one of the Balearic archipelago´s most emblematic beauty spots. Covered in leafy woodland, made up of pine and holm oak that grow down to the shore, with white sand and crystal clear waters, Formentor rises impassively out of the sea, just a few metres from its own little islet El Colomer, forming what is considered to be one of the most breathtaking panoramic views in the mucipality of Pollença. The 16th Century Talaia d'Albercuix is an ancient tower built as a defense system against the fierce and frequent attacks by the Corsairs of the period. At 380 metres above sea level, it offers the best viewpoint over the Formentor Peninsula and the Bay of Pollensa (Badia de Pollença). Crowning one end of the peninsula, at almost 200 metres above sea level, stands Formentor Lighthouse, the highest lighthouse on Majorca, with a 22 metre high tower. For over 150 years this landmark has witnessed some of the Mediterranean's loveliest sunsets. 100% Privacy. We will never spam you !